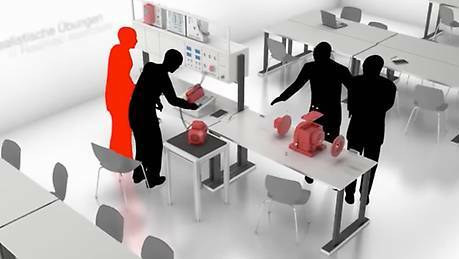 With the motor load brake didactics module, prospective electronics professionals can practice safe loading of drives on the basis of tried and test industrial components – thus gaining practical experience with the latest automation technologies. To ensure automated and efficient production processes, companies require highly trained technical personnel with relevant practical experience. These experts must be familiar with the load behavior of the drive technology systems – both in theory and in practice. Only then will they be able practice high-quality production in an economical and energy-saving manner. Intensive, application-based training is therefore essential for all prospective electronics professionals (MT, EBT, EMA, EAT, EAFT, EGS). In addition to theoretical teaching aids, they also require clear didactics modules with which to acquire the necessary practical skills. Our didactics modules are specifically designed to facilitate understanding of electro-mechanical principles on the basis of tried and tested, real-life equipment. As part of subject area 8 "Selecting and integrating drives," they help to ensure qualification at the highest level. The motor load brake (MLB) didactics module is one of these teaching aids. 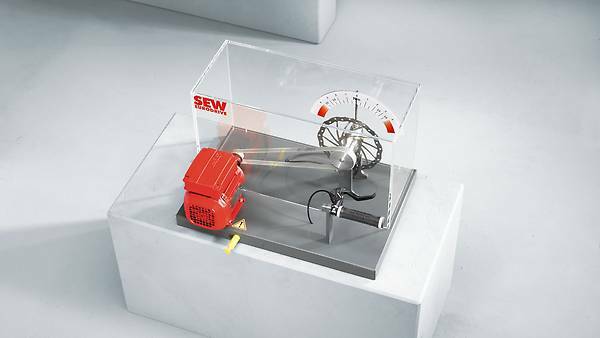 The compact table module allows trainees to practice loading of electrical drives in various forms. It is configured for the connection of drives from our modular motor system: the AC asynchronous motors of type DRS71S4 with the E17C simple encoder. The belt tension can be removed by means of a mechanism (e.g. to simulate a snapped belt). The load torque can be adjusted manually using a lever. A pointer provides an optional visual indication of the brake torque. A torque slip clutch prevents a continuous overload.